Susan Magsamen is the Senior Vice President of Early Learning at global learning company Houghton Mifflin Harcourt. She is a member of the Educational Advisory Board for the Goddard School and senior advisor to The Science of Learning Institute and Brain Science Institute at Johns Hopkins University. This piece was originally published on 01/07/2015 on the HMH blog. It’s a blizzard out there […]! I’m referring to the astounding number of new eBooks, apps and websites now available for young children. 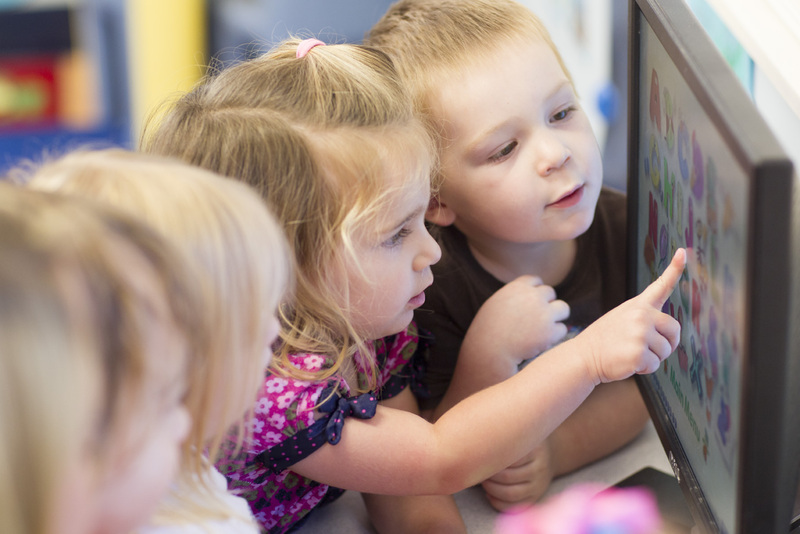 Experts estimate that there are hundreds of eBooks, story apps and learning games for children released every week. With such a deluge of digital content, it can be difficult to distinguish what is truly educational and developmentally appropriate. The good news is that there are excellent resources available to guide the way and help you make informed decisions about what to include in your child’s “digital diet.” In this series, I’ll take a closer look at these resources and share thoughts on how to harness the power of technology to enhance your child’s learning experiences. While there are no definitive rules to help caregivers decide how much screen time (and screen type) is best for their children, the American Pediatrics Association recommends that kids spend no more than two hours per day. In today’s post, we’ll discuss how to make sure that the time your kids do spend interacting with screens is age-appropriate, positive and educational. Lisa Guernsey, director of the Early Education Initiative at the New America Foundation was one of the first to put a stake in this ground on the issue of “how much is too much?” In her seminal book, Screen Time (2012), she approaches the topic as a mother concerned about the influence of television. Given the wealth of digital content on tablets and devices, the TV may seem like an antique, but Guernsey’s insights remain extremely valuable. Guernesy coined the “three C’s” – Content, Context and the individual Child – to provide families with framework for informed decision-making about screen time. This one seems obvious, especially when thinking about television or video content, but once you enter the digital space, choosing the right content can become more complicated. Buried advertisements, inappropriate distractions and dead ends, as well as the limitations of some apps, can frustrate little ones or undermine the potential learning experience. Takeaway Tip: Preview all digital media and don’t be afraid to be picky! Context is about what happens before, during and after screen time, particularly what’s happening in the child’s environment. Are there competing devices within earshot? Is the child in a distraction-free environment? Most importantly, context also includes your own interactions with your child during screen time. In fact, devices present a great opportunity for parents to play and learn along with their children, ensuring the experience is positive. Takeaway Tip: If you are joining your child in an interactive game or app, try to be undistracted. Make an effort to put your personal, digital devices aside, and minimize background noise by turning off the television and other media. When sharing the interactive experience, don’t let the device dominate the experience. Often, adults end up focused on directing the use of the device or software, rather than experiencing and exploring the content together. The ultimate objective is to help provide children with experiences that will enhance their curiosity and pique interest in themselves and the world around them. It pays to be thoughtful and seek out those games or apps that are most appropriate for your child, his/her age and interests. Takeaway Tip: Check out some trusted resources to find the best fit for your child, and to help you navigate the digital terrain! Common Sense Media and the Parent’s Choice Foundation provide independent, thorough reviews on all media for kids. The Joan Ganz Cooney Center at Sesame Workshop pioneered the value of co-viewing in the early years of children’s television, and has since updated its research to support the New Co-Viewing. On Digital-Storytime.com and DigitalMediaDiet.com, educator and mom Carisa Kluver provides astute reviews of new digital media for young children. Bottom line: A reasonable “digital diet” is essential for child growth and development. Just as we choose a balance of foods for nutrition, energy and wellbeing, we can also choose appropriate digital content and determine how we can interact with it to provide the best experience for kids. Stay tuned to this series for additional resources about creating a healthy digital diet and using technology to promote positive, fun growth experiences for young learners.